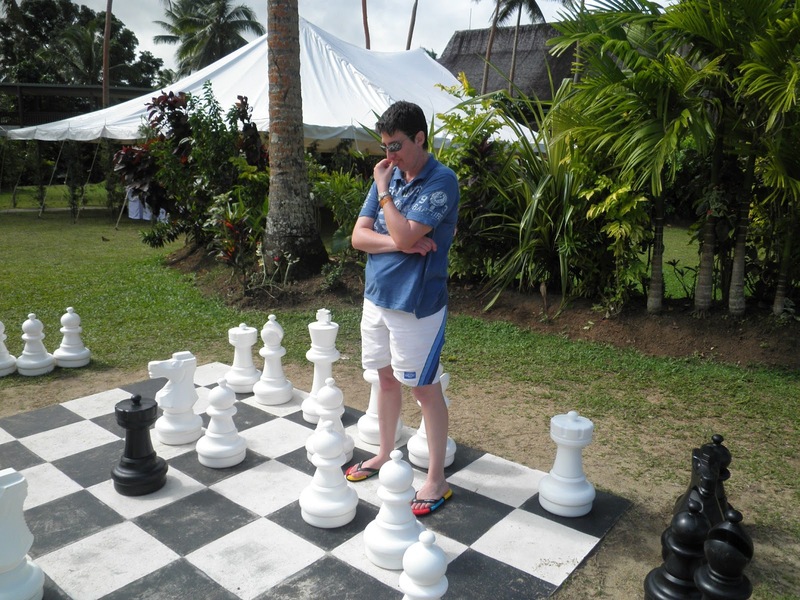 Contemplating my next move, even though I have no idea how to play chess. Things have been quiet around here over the past few weeks, and not much writing has been done. Not for want of trying – I’ve managed to get nearly a thousand words done over my last couple of days off, but it’s not nearly as much as I was planning for this time of the year. Firstly, it’s tax season here Down Under, which means my day job has gone from cruisey to hectic in one fell swoop. The problem with being an accountant, especially at this time of year, is that it’s extremely hard to relax after a big day. I wake up in the early hours of the morning after dreaming about tax issues for clients, and come up with solutions in the shower. Yeh, so not fun. So as a matter of survival, I’m not writing from Tuesday through Friday (my work days). My brain is fried enough as it is without adding the extra burden of having to come up with a few hundred words on any number of my current WIP and then feeling guilty when those words don’t materialise. Secondly, we’re (Wifey and I) madly trying to finish the house renovations so we can get the house on the market for a big move, which I’ll detail in an upcoming post. That has basically written off my weekends completely, since they’re currently spent sanding, painting, puttying, gardening and deciding on paint colours and working out how we’re going to dress our house up to look her absolute best when she’s finished. The good thing about the renovating though is that it stimulates the creative side of my brain. So instead of wearing me out, while I’m doing those mundane jobs around the house, I’ve allowed my muse to sneak down the dark alleys in my brain, seeking out new and interesting characters and plot points. So far, I’ve re-worked my YA WIP (if only in my head), which is now 40-50% complete on the first draft, and I’ve come up with two new plot twists and a new character in that same WIP which adds some spice. I’m finally happy with the direction that WIP is going in. So much so, it’s the one I have ear-marked to concentrate on above all others to get a first draft done by the end of January. I’m more excited about that WIP than I have been about any of them in a long time. I’ve also been thinking about how I want to progress on this writing path I’ve chosen, and what little of the Olympics I watched has made me do a bit of soul-searching. Winning gold is a massive achievement for any athlete, but so is winning silver or bronze, and for some, just competing at the Olympics is a success. In light of that, I’ve decided to re-define my idea of failure. Notice I’ve chosen to redefine failure as opposed to sucess. I don’t want to move the goal-posts I’ve set for myself with regards to what I want to achieve with my writing. I do, however, want to remove the barriers I keep coming up against (self-imposed I might add), in order to start achieving those little successes that build up into big ones. I’ve written about my fear of failure in an earlier post. It’s always hanging around in the background, needling me into submission, making me throw my hands up in frustration and walk away from the keyboard with nothing to show for it except a blank page and an intense feeling of guilt and heartbreak. All because my current definition of failure is zero words per day. My new definition of failure is hating writing. If I ever get to that point, that’s when I’ve failed. If I ever get to the point where I just can’t physically make myself write one word, that’s when I step back and reconsider my options. Right now? I still love writing. I love the feeling of being in “the zone” when words come easily. I also love the feeling of bleeding out a hundred or so words when they’re not so easy to come by. In some ways, I feel more triumphant on those occasions because I’ve managed to get words down in spite of feeling tired/like crap/dragging myself kicking and screaming to the keyboard. So the new plan, until my situation changes in a few months, is to only write on my Mondays off. Whether that’s a blog post or outlining my YA WIP, it doesn’t matter. Words are words. If I find myself with a spare hour or so during the week where my brain isn’t filled with tax stuff, I’ll work on the plot or character summaries, and also re-jig my writing plan to take my upcoming situation into account. At the very least, I want to stay connected to my WIP so that when I have the time to work on it, I know where I’m headed. That time will come soon enough – I just need to be ready for it. Every writing day will start with one question – “Do you hate writing?” If the answer is no, then there’s no excuses. I must write. On that note, I’m off to work on the new scenes my muse kindly offered up to me over my morning coffee.